Supporters of the Dublin Galway Greenway project received some excellent news when it was announced that Kildare, Meath, Longford and Westmeath are to receive funding for greenway projects following a decision by tourism minister Shane Ross to release unspent funds which, according to the minister, would otherwise not be drawn down this year. 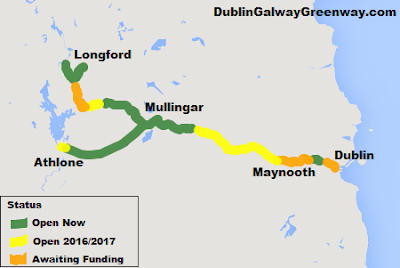 Following a review of the Cycle Network funding call of 2014, the minister concluded that not all the funding would be fully drawn down in 2016. Minister Ross decided to direct the funds to greenway projects that were ‘shovel-ready’. The total funding involved amounts to over €3.5 million, with €2.5m of that going to the 38-kilometre section running from Maynooth in Co Kildare to the border of Co Westmeath. 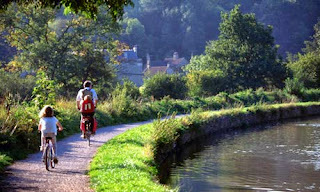 Ross stated: “Since my appointment, I have been particularly struck by the far-reaching benefits that greenways can bring to the localities in which they are situated, as is evidenced by the success of the Great Western Greenway and other projects around the country. I am pleased to now announce funding for three projects in four counties that have planning permission in place. I am confident that the projects in Longford and Westmeath will be finished by the end of this year, while the project in Kildare and Meath will be finished by the end of 2017. The Dublin Galway greeway project was 'paused' last year by the previous minister, Pascal O'Donohue, when the project ran into opposition from landowners in East Galway. At the time the minister decided to focus investment on the sections of the Dublin Galway Greenway that had planning in place. The decision by minister Shane Ross to allocate funding to Westmeath, Meath and Kildare is hoped will accelerate support for the Dublin Galway greenway and will provide space for a new round of consultation with the landowners in East Galway to find suitable alternative routes.